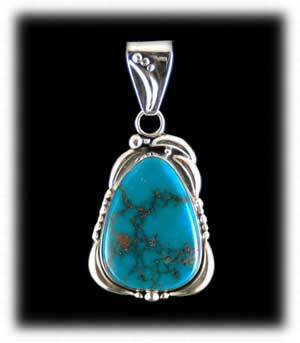 This is a selection of quality American Turquoise Jewelry from Durango Silver Company. The large Turquoise Bracelet in the center is a piece of Antique Turquoise Jewelry with an exceptional Number 8 Turquoise Stone from Nevada. 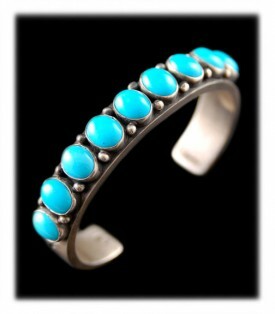 It was handcrafted by a Native American Turquoise Jewelry artist called a Navajo Silversmith in the 1940’s. The balance of the Turquoise Jewelry shown in this photo was produced by Durango Silver Co. Jewelry like this can be viewed and/or purchased by viewing our online catalog from the buttons on the left. Turquoise is one of the first Gemstones known to man and Turquoise Jewelry has been carbon dated back to 5,500 B.C during the Egyptian times. Turquoise Jewelry is worn by people around the world and it is made worldwide, as well. This composition of web pages is creditable authentic information for you to learn more about many aspects of Turquoise Jewelry – We have organized these pages to enable you to read and see photos of the Turquoise Jewelry subjects you are most interested in. Follow the links to find additional information related to the information you are most curious about. Durango Silver Company of Durango Colorado USA has been mining, collecting, dealer in and studying Turquoise and Turquoise Jewelry for nearly 40 years. We are authorities and have created these pages for your knowledge and enjoyment. Turquoise and Silver used in combination by the Navajo Indians of the Southwestern U.S. began in the late 1880’s to the 1890’s. 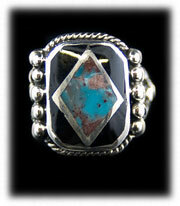 Atsidi Sani (Navajo) was taught how to work Silver earlier, however, Turquoise was not made incorporated until later. Turquoise and Silver became extremely desirable to the Native American Indians as soon as this type of Jewelry was made and it was not long after that the American public appreciated it as well. It was the combination of Turquoise and Silver that made Turquoise Jewelry take off with the public. The blue stone was beautiful when set in Silver and with the Navajo Silverwork, well, it was a piece of wearable art and the public realized this. As the Indian Trader took the Silver and Turquoise Jewelry to the market on the west coast, he found that it was widely accepted and demand grew quickly. When Tourists came to the Grand Canyon and beyond, the main item they would take home for a souvenirs was Turquoise and Silver. 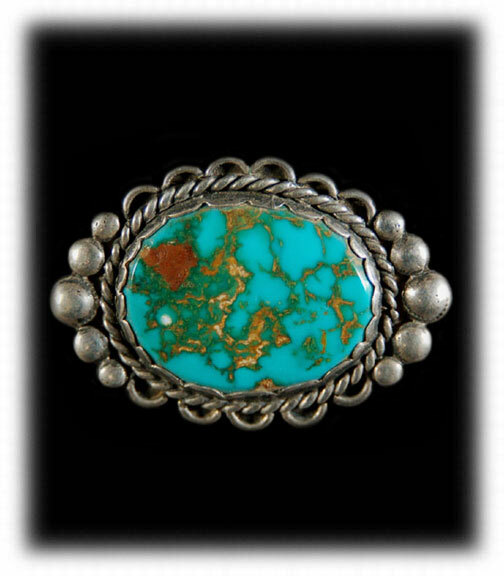 Click the link below to view some photos of early Turquoise and Silver Jewelry that has been made since its inception. American Turquoise Jewelry will be around to stay. Southwestern Turquoise Jewelry is from the Southwestern regions of the United States which are predominantly Arizona, New Mexico and Colorado. The first notable Turquoise Jewelry of modern day was first made by the Santo Domingo Indians as well as other Native American Pueblo Indians of the Rio Grande regions around 1600 A.D. They made Turquoise Beads by drilling holes in pieces of Turquoise, then grinding and sanding these pieces into a circle, thus, creating Turquoise Beads. They were strung into Necklaces with sinew (string made from the gut of a deer) or string to make the first form of Southwestern Turquoise Jewelry. The Turquoise Bead Necklaces were traded to the Navajo Indians who used them for ceremonial, medicinal and ornamental purposes. In the 1850’s, Spaniards came up from the south (Mexico) to the Southwestern U.S. in search of gold. It was common for Conquistadors to have native peoples find gold for them. 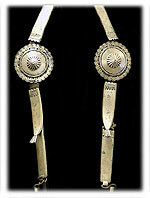 It was the Spaniards who taught the Navajo how to work with metals and specifically, Silver. It is known by 1860, a Navajo Indian named Atsidi Sani had learned the Silversmithing trade from the Spaniards and was producing silver items to be worn by the Native American Indians as well as their horses. By the 1880’s, many Navajo Indians were Silversmithing and making Indian Jewelry from silver coins they would get from the U.S. Calvary and Indian Trading Posts that were springing up throughout the Navajo Indian Reservation. Turquoise was introduced to the Navajo Silversmiths in this time period as well and it is believed that the first Navajo Indian Southwestern Turquoise Jewelry was produced before 1882. Turquoise was very desirable by Native American Indians of the Southwestern regions of the United States as it became available. Turquoise Jewelry became a form of wealth to the Natives in the early days and Southwestern Turquoise Jewelry soon became adopted as the self ornamentation of choice. It was not long before the early settlers of the Western United States took notice to the Turquoise Jewelry being made by the Indians of the Southwest. Indian Traders began taking it to market in Santa Fe and to Southern California. The first major boom for Turquoise Jewelry was when tourists started visiting the Grand Canyon and when the train made its way through Southwestern Indian Country a new industry began for the Native American Indians of the Southwest. It did not take long for the craft of making Southwestern Turquoise Jewelry to spread throughout the Santo Domingo, Navajo and Zuni American Indian nations. Individual craftsmen set up shops in their own homes and would take their wares to Trading Posts, railroad stops and to tourist areas to sell their Jewelry. It became more and more popular and as demand grew, production shops were set up along Route 66 to mass produce Southwestern Turquoise Jewelry to accommodate the market. Today, Turquoise Jewelry has become an industry standard in Southwest, it is recognized and admired throughout the world. It has a colorful history and it is in fashion by the apparel industry of the United States. Southwestern Turquoise Jewelry and Mexican Turquoise Jewelry has a broad selection of design and appearance which makes it attractive to wear in any type of lifestyle. For more information on Southwestern Turquoise Jewelry, read on. For more information on Southwest Jewelry, read on. 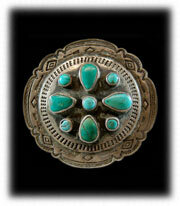 Antique Turquoise Jewelry from the early years of its making has become very collectible. Jewelry designs have changed dramatically since the early years and Antique Turquoise Jewelry holds many factors that make it highly desirable for collectors worldwide. The first Turquoise Jewelry was made for the Native American Indians themselves to be worn which has a significant value to collectors as it was the first phase of Turquoise Jewelry from the American Southwest. The second phase was the period of discovery from 1890 – 1920, in this time period Indian Jewelrywas being made, in what is now considered crude methods, within the Hogan’s / Homes of the Native American Indians of the Southwest. 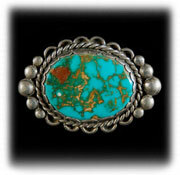 The third phase of Antique Turquoise Jewelry was when it became industrialized, which is the 1920-1960 period. Phase One Antique Turquoise Jewelry was made by using the earliest techniques to create this art form. The Santo Domingo worked Turquoise with grinding wheels that were turned by hand and they even used rocks on the ground to shape their Turquoise Beads. The Navajo took silver coins they would obtain from the U.S. Calvary and then the Indian Traders, melt them down in camp fires, pour the molten metal into ingots and then pound the ingots into sheet and wire to form their Jewelry – this is called “Navajo Ingot Jewelry.” The Navajo would cut their Turquoise to be set in the Jewelry by using flat rocks to grind it then polishing it on leather they made from Deer, Elk or Sheep. Phase One Antique Indian Jewelry is now rare and extremely hard to find. Phase Two Antique Turquoise Jewelry is a little more modern as the Native Americans had learned how to make tools of steel to form and stamp their Jewelry and Indian Traders brought in early forms of modern equipment such as stone grinders, blow torches, hammers, steel, anvils and etc. Once the Native Americans had better tools to work with the production and quality of Jewelry increased. This was actually the industrialized developmental period of Turquoise Jewelry, prior to the heavy production period which was soon to follow. Phase Two Antique Indian Jewelry is collected for its outstanding beauty and craftsmanship from a Native American Indian Culture that was still not modern in any way, shape or form. It is truly distinctive and each and every piece of this Native American Turquoise Jewelry is unique to itself with no two pieces alike. Phase Three Antique Turquoise Jewelry is from the modernization period of Native American Indian Turquoise Jewelry. It is this time frame when the demand had become significant enough to make the production of Jewelry an industry for the Native American Indians of the Southwest. Jewelry Supply Houses and Traveling Traders equipped the Native American Jewelers with modern tools and supplies to make their Jewelry more efficiently. Jewelry supplies were made available mostly on the trade routes which were between Flagstaff Arizona and Albuquerque New Mexico. As a result, the heaviest concentrations of Turquoise Jewelry manufacturing took place around the larger cities such as Flagstaff, Winslow, Gallup and Albuquerque. The Native Americans that lived away from the larger trade areas would have to travel by horse to trade their goods, it is clearly obvious that their Jewelry is different from the Jewelry that was produced in the closer to the cities. In this period, Turquoise Jewelry production shops began were Native American Indians would come to work daily and get paid hourly to produce Turquoise Jewelry in high production quantities and even assembly line type work. This is the period when companies such as the Fred Harvey Company, Sunbell, Maisels and others developed specific line and styles of Southwestern Styled Turquoise Jewelry for mass production. They brought in large machinery such as power presses, casting machines and other to produce mass qualities of Turquoise Jewelry for the tourism trade that had become a reality. Phase Three Antique Turquoise Jewelry: is highly collected by many people as there is a lot more of this type of old Indian Jewelry available to collect. It was a unique period in time and the Turquoise Jewelry from this period has its own character. In this period, the Jewelry was refined to meet the demands of the modern minded public that were coming to the Southwest and would take home Turquoise Jewelry as their main souvenir from their trip to the Great American Southwest and the Grand Canyon. The Turquoise used in this period was more refined and attention to the quality of the Turquoise used in the Jewelry had risen substantially. New Turquoise Mines sprung up in Arizona, New Mexico and Colorado competing with each other to sell their Turquoise to the trade. Sky Blue was the color of choice and the variations color and hardness from mine to mine differed greatly. It quickly became an issue to Indian Traders and consumers alike, the type and quality of the Turquoise used in the Jewelry was a determining factor of the actual value of the piece. The Santo Domingo Indians were the first Native Americans to make Turquoise Beaded Jewelry for trade and the marketplace. The Santo Domingo Indian Reservation is located just south of Santa Fe so they had a marketplace to sell their goods close to home. They were making Turquoise Beads for the market prior to the Navajos putting it into Silver and they were trading Turquoise Beads to the Navajo before the Navajos made Jewelry. So, it was the Santo Domingo Indians that gave the Navajos the idea to use Turquoise in their silverwork. Antique Santo Domingo Turquoise Bead Jewelry is fairly easy to detect as they used a lot of Turquoise from the Cerrillos New Mexico, Saguache Colorado and the Conejos Colorado regions to make their Turquoise Beads. This Turquoise is very distinctive and easily spotted by the trained eye and John Hartman is an authority on old Santo Domingo Turquoise Beaded Jewelry. Antique Santo Domingo Turquoise Bead jewelry is some of the most popular antique or vintage Turquoise jewelry today. The Santo Domingo jewelry is very beautiful, finely crafted and simple enough to wear on a daily basis. The Santo Domingo bead jewelry has been in fashion since the Anasazi and will continue to be popular till the end of time. 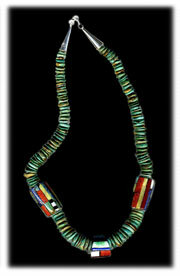 Bead jewelry, inlcuding Antique Santo Domingo Turquoise Bead Jewelry is a major fashion statement. The Navajo Indians were the first Native Americans to make Turquoise in Silver Jewelry. The style of their Turquoise Jewelry was bezel set stones with extensive silver work surrounding them. They used one to many Turquoise Stones in each piece of Jewelry they made. They made their own stamps for tooling the silver out of old blacksmith steel, old files, screwdrivers and whatever other steel they could find that would temper/harden. Antique Navajo Turquoise Jewelry is easy to detect by a trained eye and John Hartman of Durango Silver Company has been collecting Antique and Vintage Turquoise Jewelry for over 40 years. The Zuni Indians of New Mexico started making Turquoise Jewelry after the Navajos around 1900 A.D. Traders to the Zuni Indians worked with the Zuni’s to develop a different style than Navajo Indian Jewelry. 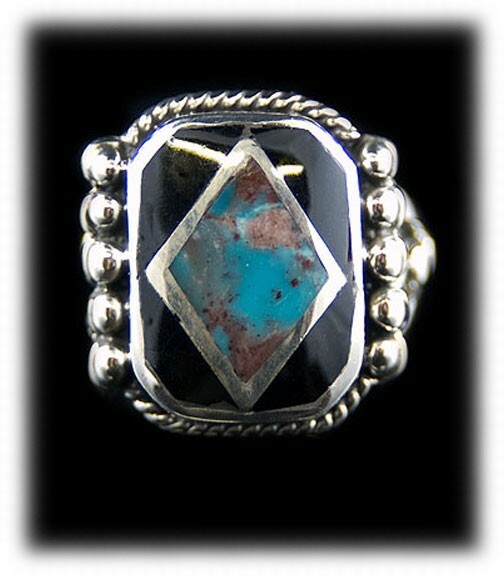 Zuni Indian Turquoise is more stone orientated with less silverwork that Navajo Jewelry. The Zuni Indians do what is called “lapidary work” and that is Stone work. They are known for using lots of tiny Turquoise Stones called Petit Point and Needle Point. They are also known for Inlaid Turquoise Jewelry as well. Antique Zuni Turquoise Jewelry is easily detected by the trained eye and John Hartman is an authority on Antique Zuni Turquoise Jewelry. Petit-Point is tiny round, oval, square or rectangle stones set in multiples to create an overall dotted type of design. 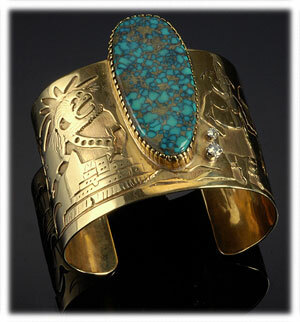 Some Antique Zuni Turquoise Bracelets will have as many as 150 Turquoise stones incorporated into one piece of Jewelry. Needle-Point is tiny stones shaped like the eye of a sewing needle set in multiples to create a cluster type Jewelry design. The Zuni Silversmiths have made Needlepoint Jewelry since the 1920’s and still make it today. They made Rings, Pendants, Necklace Sets, Bracelets, Earrings and many more Jewelry items. Antique and Vintage Zuni Indian Jewelry can be detected easily by a trained eye, again, John Hartman of Durango Silver Company is an authority on old Zuni Indian Jewelry. 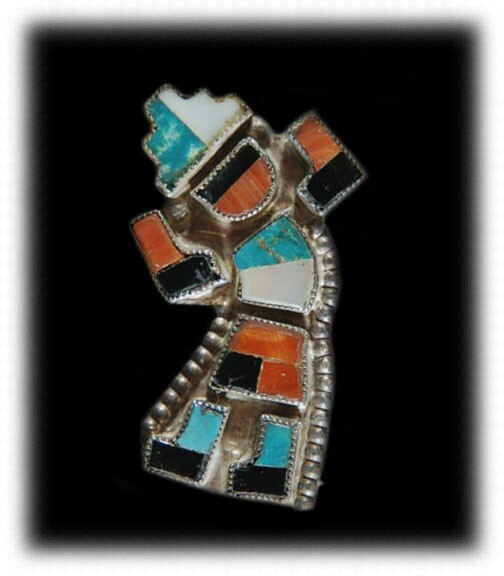 Zuni Inlay Jewelry is noted as being some of the best examples of early lapidary work by Jewelers in the world. Antique Inlaid Turquoise Jewelry by the Zuni Indians is some of the most collectible Antique Turquoise Jewelry today. 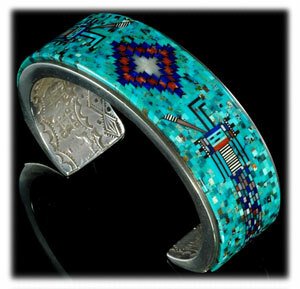 The Zuni Indians painstakingly Inlaid individual Turquoise and other colored gemstones into channels created in silver to make this very special and unique style of Indian Jewelry. Antique Zuni Inlaid Jewelry is easily detected by a trained eye and John Hartman from Durango Silver Company has those trained eyes for Antique and Vintage Zuni Inlaid Turquoise Jewelry. Pawn Indian Jewelry began in the late 1800’s. Often, Native Americans would need quick cash for living expenses and they did not want to sell their personal belongings, so, they would pawn their Indian Jewelry, Rugs, Pottery or anything they had of value. In most cases the Indian Traders had trade goods such as food, clothing and living essentials that they would then sell to the Indians as a convenience as well as another means for the Indian Trader to make money. Pawn Indian Jewelry was the most desirable item for the Navajo Indians as well as the Indian Traders of the Southwest to pawn. The Indian Traders had to keep pawned items safe and most Indian Traders had vaults to put small and valuable items in, Pawn Indian Jewelry went in the vault and was very safe and easy to organize for the Indian Trader. The Indian Traders would evaluate the Turquoise Jewelry and would pawn Indian Jewelry for about 25% of the value of the item. They would charge the person 10% per month to keep the Turquoise Ring, Bracelet, Necklace, Concho Belt or other in safe keeping. As long as the person would come in and make interest payments on the pawned item, the Indian Trader would continue to loan the principle amount on the piece that was pawned. If the person became delinquent on his/her interest payments for a given time the item pawned would go dead. If the pawn Indian Jewelry went dead, the Indian Trader would then own the piece of Jewelry. He would do as he wished with the dead pawn and that was usually to put it up for sale to the public in a display case in the Indian Trading Post. When Pawn Indian Jewelry went dead and was put up for sale, there was an immediate market by the Native American Indians as the Indian Trader would generally sell the Pawn Indian Jewelry as used Turquoise Jewelry and it was much cheaper than new Indian Jewelry. The Native American Indians did not care if Turquoise Jewelry was new or old, they liked the Jewelry for its own beauty and they were buying it to wear. Many tourists liked old pawn Indian Jewelry as well, they liked the idea that it had been made for the Indians themselves and had spiritual properties. Many tourists and Americans believed, as the Native American Indians, Turquoise has metaphysical powers, it is spiritual, and it brings health, happiness and good fortune to the bearer, and pawn Indian Jewelry is the most powerful as it was once owned and cherished by a Native American Indian. Today, the Pawn Indian Jewelry Trade is as strong as it ever was! Native Americans as well as other individuals that live in the Southwest have come to know that pawn shops are a quick way for immediate cash and Pawn Indian Jewelry is still one of the best things to pawn. The conditions for pawn still remain about the same today as they did a hundred years ago. If you do not want to lose the item you pawned for a fraction of its value, you had better pay your bill. 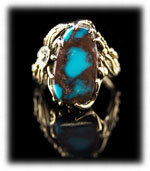 Indian Turquoise has been the slang name for Turquoise Jewelry since the 1800’s. Turquoise was founded by American Indians of the Southwest hundreds of years ago so, in reality, the term “Indian Turquoise” makes sense tosome. However, Indian Turquoise Jewelry is actually the proper, politically correct, terminology that should be used in thismodern period of time. The phrase “Indian Turquoise” is an illiterate and insulting phrase to the Native American Indians, as a matter of respect, it should no longer be used! Now that the air should be clear, Indian Turquoise Jewelry is from the Southwestern Regions of the United States and is primarily made by the Navajo and Zuni Native American Indians. American Indian Turquoise Jewelry is a part of the heritage of the United States of America and it is relevant to the history of our country and the American Southwest. With due respect, Native American Indian Turquoise Jewelry was an art form and trade developed by the preceding ancestors of the Navajo and Zuni Native American Indians. It had been carried on for many generations of the Native American Peoples, credit, respect and honor should be given to and respected by Americans as well as people throughout the world. Durango Silver Company supports Native American Indians and respects their many crafts including Native American Indian Turquoise Jewelry. We have been Traders to the Navajo and Zuni Indians for decades and offer their authentic Turquoise Jewelry, as well as others for sale Online as well as in the Durango Silver Trading Post located in Durango Colorado USA. For more photos and information on Indian Turquoise Jewelry, read on. Native American Turquoise Jewelry is made by Native Americans and/or Native American Indians primarily living in the Southwestern regions of the United States. Native American Turquoise Jewelry is considered to be of a Southwest Style which has a particularly Native American look in appearance. Usually, it is a Turquoise Gemstone accented, in most cases, by Sterling Silver and occasionally Gold. The accents and/or embellishments are stampings, engravings, fabricated ornaments, shaped, stamped and sculptured wire designs, repose (bumped up, raised or domed metalwork) and other types of alpacas unique to each individual Native American Turquoise Jewelry Maker. The type and quality of the Turquoise and/or Turquoise Stone has always been of great importance to the Native American People as it is their belief that Turquoise has spiritual and metaphysical powers. Native American Navajo Turquoise Jewelry is known for a Turquoise Gemstone set in a bezel of Silver then elaborately decorated with Sterling Silver embellishments. Many Navajo Jewelers aggressively create unusual Jewelry items that go way beyond the typical boundaries of standard Navajo Turquoise Jewelry. High quality Navajo Turquoise Jewelry is very collectible and has great value for collectors and investors. Native American Zuni Turquoise Jewelry – The Zuni Native American Indians have been and continue to make excellent Turquoise Jewelry. Their unique designs will continue to stand the test of time and remain in high fashion for years and generations to come. Petit Point, Needle Point and Inlay Jewelry made by the Zuni Indians of New Mexico is exquisite and generally of very high quality. 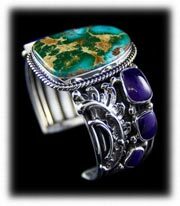 Additional information on Zuni Turquoise Jewelry, old and new, can be found throughout the Durango Silver website, we invite you to follow the links to this exciting Jewelry made in American by the Zuni Indians. For more photos and information on Native American Turquoise Jewelry, read on. Southwest Turquoise Jewelry is a style of Jewelry made in the Southwestern Regions of the United States. Native American Indians, Anglos, Hispanics and other cultures of people work from their homes and/or in Jewelry manufacturing shops located throughout the Southwest. There is most definitely a style of Jewelry that is known as Southwest Turquoise Jewelry. Predominately, the Jewelry items are made in Sterling Silver and are of two major Jewelry types bezel set Turquoise Jewelry and Inlaid Turquoise Jewelry. Bezel Set Turquoise Jewelry is when one or more Turquoise Cabochons are incorporated into a constructed ring, bracelet, pendant or other to create a piece of Jewelry. The silverwork can be simplistic with very little design which put the focus on the Turquoise Stone or it can be tooled and sculptured which can make the piece of Jewelry fancy to even extremely elaborate. Different Jewelers have different techniques and styles of creating Southwestern Turquoise Jewelry that individualizes their Jewelry, known artists usually sign their Jewelry with a makers mark, metal type and sometimes even the type of Turquoise used in the piece. Inlaid Turquoise Jewelry is much different then bezel set Jewelry as a framework is created in metal with channels or voids in the metal to Inlay one or more Turquoise stones into. Once the stone is precisely cut to fit the channel, it is glued in, ground, sanded and polished to blend in with the design of the Jewelry item. Generally, Inlaid Turquoise Jewelry has a smooth and sleek look and feel. Often, the Turquoise is accented with color coordinated gemstones that create an array of different and unique looks. Turquoise Jewelry from Southwestern United States is known for its unique styles that are different from Jewelry made anywhere else in the world. It has an organic appearance that is very desirable in most lifestyles and is found worn by people in all walks of life. For more photos and information on Southwest Turquoise Jewelry, read on. Handcrafted Turquoise Jewelry or Handmade Turquoise Jewelry is fabricated by hand. This means a craftsman uses silver sheet and multiple shapes of wires along with their own personal techniques to design a piece of Jewelry. Jewelers engrave, stamp and shape the metal to create one of a kind works of art. There is no doubt that some Jewelers are simply better than others! There are talented and experienced Jewelers that create amazingly beautiful handcrafted Turquoise Jewelry items that are true works of art and some that produce junk Jewelry as well. High quality hand crafted Turquoise Jewelry is found throughout the Southwestern United States as well as in many other areas of our country and the world by individual Jewelers who have access to Turquoise. Some Jewelers, such as Durango Silver Company of Durango Colorado even cut their own Turquoise for their Jewelry. In the case of Durango Silver Company, they mine and have collected rare types of Turquoise for decades and incorporate specially selected, hand cut Turquoise Gemstones to be made into Turquoise Jewelry that is unique to Durango Silver Company. Handcrafted Turquoise Jewelry made with high grade Turquoise from our company often has the type of Turquoise used stamped in the Jewelry to verify the origin of the Turquoise. In this new age of high tech automation, it is becoming more and more difficult for companies to take the extra time to make things by hand. Durango Silver Company is proud to offer one of a kind, handcrafted Turquoise Jewelry, we take pride in every piece we make or have made for us. We invite you to take a look at our unique American Tuquoise Jewelry that has been handcrafted here in the Southwest. For more photos and information on Handcrafted Turquoise Jewelry, read on. Turquoise Bead Jewelry in America began with the Anasazi Indians of the Southwest United States approximately 100 A.D. or earlier. Examples of Turquoise Bead Jewelry have been found at Chaco Canyon dating prior to 900 A.D. and the Santo Domingo Indians have been making Turquoise Bead Jewelry for over 200 years. Globally, Turquoise Bead Jewelry has been found dating back over 5000 years. Turquoise was found in Egypt well over 7,500 years ago and Genuine Turquoise Jewelry including Turquoise Bead Jewelry has been carbon copied from that area dating to 5,500 B.C. (Cairo Museum, Egypt). In recent years it was the Santo Domingo Indians of New Mexico that brought the attention to Turquoise Bead Jewelry in America. The Santo Domingo Indians have done lapidary work, making beads, for hundreds of years. They are responsible for the first commercial trade in Turquoise Bead Jewelry on the Santa Fe Trail which became a major trade route beginning in the 1600’s. The Santo Domingo got their Turquoise from the Turquoise Mines located near Cerritos New Mexico and the Conejos Regions of Colorado (Southern Colorado near Manassa). Heavy trade in Santo Domingo Beaded Necklaces began shortly after the 1900. In the 1980’s, the Tucson Gem and Mineral Show had become highly recognized as the #1 location on earth to buy, sell and trade rocks and gems. Turquoise was one of the leading commodities sold in its early years and Turquoise takes no back seat today. By the 1990’s and the advent of NAFTA and GATT free trade agreements, gem and mineral traders from all over the world began showing up at the Tucson Gem and Mineral Show. A group of Indian Traders from the Southwest U.S. went to China to find a deposit of Spiderweb Turquoise that was beyond belief. They proceeded in purchasing all of the past Chinese Turquoise dumps which held thousands of pounds of high grade natural Spiderweb Turquoise. The Chinese, as inquisitive and money hungry as they are, woke up to the fact that there was a big Turquoise market. They showed up at the Tucson Gem and Mineral Show and jumped on the Turquoise Wagon. At this time, the interest in beads and Turquoise Beads was beginning to do very well and were of great interest to the buyers at the market. China tooled up its factories and began producing Turquoise Beads in all shapes and sizes. They were a total hit at the Tucson Gem Show and soon the American public went on a bead frenzy! Today, the bead market is bustling and China produces about 90% of all beads that are on the market, worldwide. There is a completely different market for Turquoise Bead Jewelry than there was in the days of the Santo Domingo Bead Makers. Beads are mass produced using automated machines in every size, shape, color and quality. They are sold by the 16” strand and the more you but the cheaper they get. High Grade Turquoise Beads have almost vanished from the market, the Chinese run through so much material they do not take the time to grade the beads. There are very few people that know quality Turquoise Beads when they see them and so the bulk of the Turquoise Bead Jewelry on the market is more Chinese Junk. Durango Silver Company has been in the Turquoise Jewelry business for almost forty years and were lucky to realize the value of the first Chinese Turquoise that came to our country in the 1980’s. We had purchased a lot of high grade natural Chinese Turquoise and still seek it today. It has become very scarce and is drying up quickly. We make our Turquoise Bead Jewelry from the finest Turquoise Beads available and we send Turquoise from our own mines to be cut into Turquoise Beads as well. We hand pick each bead that we use in our Turquoise Bead Jewelry and Nattarika oversees that all of our Turquoise Bead Jewelry is world class. We invite you to look at our Turquoise Bead Jewelry examples page and to look at the Jewelry we have available in our Store. Turquoise Jewelry has been around for thousands of years. It has been worn by Kings, Queens, Princes and Princesses; it has been in fashion for thousands of years by many, many important peoples of the world. Today, Fashion Turquoise Jewelry is seen on movie stars, rock stars, in Fashion Magazines, on the Television and in the Movies. Turquoise Jewelry is in Fashion! To the left famous actress Salma Hayek wears American Turquoise Fashion Jewelry. Checkout Selma's unique fashion Turquoise pendant and necklace. Durango Silver Company has even had our jewelry featured in a few fashion magazine including Vogue and Glamour magazines. Durango Silver Company has had our silver and Turquoise jewelry as well as our fashion Turquoise bead jewelry featured in articles. Fashion Turquoise Jewelry is in the mind of the beholder. Many people wear Turquoise Jewelry every day of their lives and they consider it to be part of their life, they actually wonder? Fashion Turquoise Jewelry??? While other people coordinate their dress ensemble daily and include high fashion Turquoise Jewelry as part of their attire. We consider fashion Turquoise Jewelry to be a bit more flashy and substantial. It’s true, when we get that fantastic “one of a kind” Turquoise Stone that knocks our socks off, we do think of Fashion Turquoise Jewelry. We love making Fashion Turquoise Jewelry and we enjoy seeing people wear it! Turquoise is a beautiful gemstone and it has color ranges that are spectacular, it lends itself very well to the fashion Jewelry market. We make all types of Fashion Turquoise Jewelry, from rings, earrings, bracelets, Pendants, necklace sets, belt buckles and much more. We often make large and bold pieces of Jewelry with multi-colored gemstones that accent the Turquoise, which makes some pretty outrageous Fashion Turquoise Jewelry. We invite you to browse through our Online Store. If you life unique Turquoise Jewelry with a flare, check out this Fashion Turquoise Jewelry examples page! Silver Turquoise Jewelry means Turquoise Jewelry made from the precious metal and Sterling Silver. Sterling Silver is 92.5% pure Silver and 7.5% copper. Turquoise is one of the first gemstones known to mankind, which was originally discovered more than 8,000 years ago in the holy land of Egypt. Silver Turquoise Jewelry from Durango Silver Company is some of the highest quality Turquoise Jewelry being produced in the world today. In the 1980’s, the Tucson Gem and Mineral Show had become highly recognized as the #1 location on earth to buy, sell and trade rocks and gems. Turquoise was one of the leading commodities sold in its early years and Turquoise takes no back seat today. By the 1990’s and the advent of NAFTA and GATT free trade agreements, gem and mineral traders from all over the world began showing up at the Tucson Gem and Mineral Show. A group of Indian Traders from the Southwest U.S. went to China to find a deposit of Spiderweb Turquoise that was beyond belief. They proceeded in purchasing all of the past Chinese Turquoise dumps which held thousands of pounds of high grade natural Spiderweb Turquoise. The Chinese, as inquisitive and progressive in business as they are, woke up to the fact that there was a big Turquoise market. They showed up at the Tucson Gem and Mineral Show and jumped on the Turquoise Wagon. Durango Silver Company has been in the Turquoise business, located in Durango Colorado for nearly 40 years. We produce authentic Silver Turquoise Jewelry of unquestionable quality and guarantee our Jewelry 100% to meet your total satisfaction. Our Silver Turquoise Jewelry is handcrafted here in Durango Colorado and throughout the immediate Southwestern areas adjacent to our area. 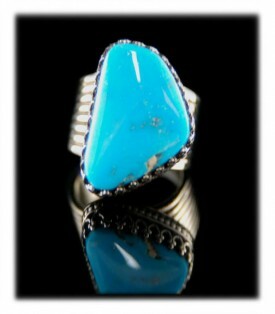 We predominately use authentic high grade natural American Turquoise in our Jewelry. We do use Turquoise from other parts of the world when we can find guaranteed authentic high quality Turquoise. Most of our Silver Turquoise Jewelry is bench made, meaning handcrafted from Sterling Silver sheet, wires and hand fabricated findings. We make Southwestern Style Jewelry with gemstone quality Turquoise Cabochons as well as Silver Turquoise Inlaid Jewelry – Inlaid Turquoise Jewelry means we fabricate the Silver Jewelry items to hand inlay individual Turquoise Stones into channels/voids to create a smooth or sleek type of Turquoise Jewelry. 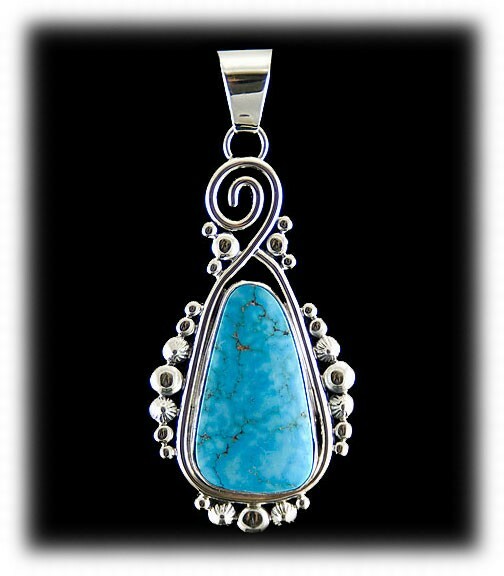 Durango Silver Company of Durango, Colorado USA is ranked #1 for authentic quality Silver Turquoise Jewelry. Our reputation for producing exceptional Turquoise Jewelry is world renown and we have produced giant quantities of Silver Turquoise Jewelry for the world for nearly 40 years. We invite you to look at our Silver Turquoise Jewelry to see the beautiful pieces that we produce and that can only be purchased through our company. We do not mass produce and mass market our Turquoise Jewelry! Our Trading Post located in Durango Colorado and our Online Store are the only two places you can find Silver Turquoise Jewelry produced by our company. There are many factors that must be considered to justify a value on a particular piece of Turquoise Jewelry. Most Turquoise Jewelry from the Southwest is totally hand made with one-of-a-kind Turquoise Gemstones that range in size and quality. The craftsmanship of the Silverwork ranges dramatically according to the particular Silversmith or Artist that made the piece. So, to get a true and accurate Turquoise Jewelry value is not as easy as going to a standard Jeweler or Antique Store, they will just simply flip a number off the top of their head based upon its appearance in their untrained eye and you could be seriously mislead. We have herd many stories from people that said, “I had a piece like this and sold it for X dollars,” well, that is a loaded statement! Yes, people have had $5,000.00 pieces that they have sold for less than $100.00 just like the famous paintings that have been sold for a fraction of their value. Some Turquoise Jewelry is very valuable and some is not, it seriously needs to be examined by someone who is educated in the business to achieve an accurate Turquoise Jewelry value. To get an actual Turquoise Jewelry Value takes a trained professional person that has been in the Turquoise Jewelry business for a substantial period of time. This person must have a tremendous amount of knowledge as there are many factors that have to be taken into consideration to get a realistic evaluation of a piece of Turquoise Jewelry. 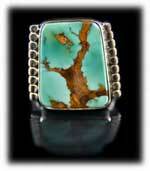 John Hartman of Durango Silver Company has been collecting Turquoise and Turquoise Jewelry for over 40 years. He is a master Silver and Goldsmith and has literally made hundreds of thousands of pieces of Southwestern styled Jewelry, handcrafted as well as heavy production for world trade. He is very familiar of Turquoise Jewelry Values on Antique and Vintage Turquoise Jewelry, Jewelry made by specific Native American Indian Artists and the values of general Turquoise Jewelry that has been made from the past several hundred years. As in all other businesses, people do not give the information that they have spent their live obtaining away for free. If you want a professional opinion or a certificate of value from a qualified professional, John Hartman, we provide this service for a fee. Please see our Turquoise Jewelry Values and appraisal fee informational. Blue Turquoise Jewelry has historically been the color of choice by most people seeking Turquoise Jewelry. Most individuals are attracted to the color of blue in Jewelry as well as many other things. Blue Turquoise Jewelry holds more that 75% of the Turquoise Jewelry Market and has historically done so. There is no doubt, Blue Turquoise Jewelry is very beautiful and attractive on anyone who wears it. Blue Turquoise Jewelry is generally made with Turquoise from Arizona. The Turquoise Mines of Arizona that are of great note are Bisbee Turquoise, Kingman Turquoise, Sleeping Beauty Turquoise and Morenci Turquoise. The Bisbee and Morenci Turquoise Mines have not been producing Turquoise for many years and have become quite scarce as well as valuable to collectors. The Sleeping Beauty Mine is still in production but rumors are that the Turquoise deposits are becoming depleted rapidly. The Kingman Turquoise Mine is going strong and has proven to be America’s most prolific Turquoise Mine to date. Turquoise Jewelry made with Bisbee Turquoise is highly collectible as Bisbee Turquoise is claimed to be the finest Blue Turquoise that ever came out of the ground in America. It is true blue in color with chocolate or red colored matrix which runs in very unique patterns including Spiderweb. Bisbee also produced some green Turquoise that is beautiful but much less common. Bisbee Turquoise Jewelry is seldom found for sale these days as there is no supplier of the material to make Jewelry with. The Bisbee Turquoise Jewelry that shows up comes from few Silversmiths or Turquoise Jewelry Manufacturers that are lucky enough to run across a small collection or have had one from the past. Morenci Turquoise Jewelry is much like Bisbee Turquoise Jewelry, it is rarely seen any longer as the mine stopped producing Morenci Turquoise in the mid 1980’s. They were getting quite a bit of Turquoise out of the Morenci Mine when they were actively seeking it and it came to an end much later then the Bisbee Turquoise mining did, so there is more of it around than Bisbee – but it too is very scarce. Morenci Turquoise is beautiful true blue in color with iron pyrite (silver colored) and black iron matrix. It often has white matrix as well. Morenci Turquoise Jewelry has a bright blue color about it that stands out from a distance, it is unmistakable to the trained eye. It is in high demand but it is rarely found for sale. Sleeping Beauty Turquoise Jewelry is readily available in today’s marketplace as the mine is producing Sleeping Beauty Turquoise on a regular basis. Sleeping Beauty Turquoise is true blue in color with very little matrix, often you will find what is called “water webbing” which is unique and desirable by collectors and sometimes a lighter blond to slightly yellowish matrix will be found in the Turquoise from the Sleeping Beauty Turquoise Mine. Sleeping Beauty Turquoise Jewelry is beautiful and it is readily available. The light to medium blue hues of this Turquoise makes it very attractive in Jewelry and clear blue or sky blue Turquoise is in very high demand globally as peoples in many countries highly value clear blue Turquoise with absolutely no matrix. There are a lot of Sleeping Beauty Turquoise Beads available as this type of Turquoise lends itself well to bead making as it comes out of the mine in semi-round shaped nuggets. Kingman Turquoise Jewelry is predominantly what you will find in today’s Turquoise Jewelry Market. Kingman Turquoise is predominantly blue in color, but, the mine also produces beautiful green colored Turquoise as well. They call the green Turquoise, “Turquoise Mountain”. Blue Kingman Turquoise has white, black and occasionally iron pyrite matrix while the green Turquoise produced from the Turquoise Mountain area of the mine has predominately tan to golden brown matrix. There is a wide variety of Kingman Turquoise so it takes a trained eye to detect this stone. It is often mistaken for other types of Turquoise as it has so much variation in color as well as matrix. Kingman Turquoise Jewelry is readily available in today’s market and it is beautiful. The Navajo, Zuni and all manufacturers of Turquoise Jewelry in the Southwest depend on Kingman Turquoise as the stone of choice as it has long been the standard stone used in Southwestern Turquoise Jewelry. A lot of Turquoise Beads are made with Kingman Turquoise as well and all types of Kingman Turquoise Bead Necklaces and Beaded Jewelry can be found with this type of Turquoise. Green Turquoise Jewelry is also very attractive and there are many people that prefer it to blue Turquoise. Jewelry made with Green Turquoise has an entirely different appearance, it is a more earthy, holistic look and often it is associated with Antique or Vintage Turquoise Jewelry as it has an ancient appearance to many people. Green Turquoise Jewelry is definitely in its own league and in high demand for those who prefer green to blue – and there are many! 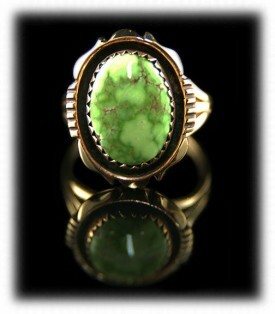 Green Turquoise predominately comes from Nevada in America. Nevada Turquoise Mines tend to be quite different than Arizona Turquoise Mines as the pockets of Turquoise are much smaller and it is often found in thin veins which make it much harder to mine. Green Turquoise tends to have much more variation in matrix and the configuration of the matrix, spider webbed Turquoise is much more prevalent in Green Turquoise than blue as well. Mining of Green Turquoise in Nevada has slowed down in recent years due to cost of mining and government restrictions which has made the red tape of mining difficult. Due to this fact, collectors seek high quality Nevada Green Turquoise for its scarcity/rarity and the value of Green Turquoise has rising substantially in recent years. Green Turquoise Jewelry is highly desirable by many and the ones who appreciate Green Turquoise Jewelry go nuts seeking examples of the various known Turquoise Mines of Nevada. True Turquoise junkies collect all the colors of green from forest green to the rare lime green Turquoise. Here are a few of many types of Green Turquoise Jewelry and the Turquoise Mines the stones come from that are used in it. 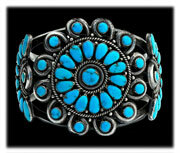 Royston Turquoise Jewelry has been one of most predominant types of Southwestern Jewelry found in recent years. The Royston Turquoise mine has been the most active mine in Nevada and poduces beautiful blue and green Turquoise used in silver and gold jewelry. Royston Turquoise Jewelry is very colorful due to the variation in color of the natural Turquoise, which runs from blue to green with all shades. Often a particular stone will be multi-colored, blue to green, which is the most popular coloration for Royston Turquoise Jewelry. The matrix in Royston Turquoise is a beautiful golden brown color for the most part, and many consider it a picture stone as the matrix can be very dynamic and dramatic including spiderwebbing. Royston Turquoise Jewelry is highly collectible and a must for the avid Turquoise Jewelry collector to have in their collection. You will not find Royston Turquoise jewelry in your average tourist storist store, it will be found along side high end Native American Jewelry and other top grade Turquoise Jewelry in galleries and well established retail venues. Carico Lake Turquoise Jewelry is spectacular as the color and matrix of Carico Lake Turquoise is intense. The Nevada Turquoise mine produces predominately a light blue Turquoise, but is more famous for it's rare lime green Turquoise. The high grade blue Turquoise is a medium blue and has beautiful orange - brown spiderwebbing. The high grade lime green Carico Lake Turquoise is shockingly bright and produces a lime green color that is off the charts. It also produce beautiful lime green to blue fade Turquoise as well and the matrix in Carico Lake Turquoise is most often a pretty golden brown color and often includes spiderwebbing. Carico Lake Turquoise Jewelry is generally more expensive than other green Turquoise Jewelry as the Turquoise is more valuable and highly sought after by collectors. 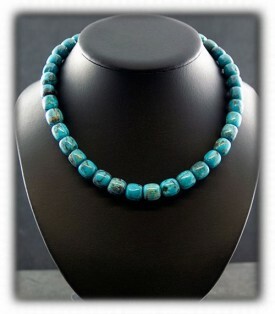 Carico Lake Turquoise Jewelry is unmistakable by the trained eye as well as Turquoise collectors. Tonopah Blue Gem Turquoise Jewelry was the standard from about 1920 to the mid 1960’s. Blue Gem Turquoise is spectacular and was a high producer years ago. This type of Turquoise is usually very hard and takes a high polish which makes it very attractive. It has a true blue/green Turquoise coloration with outstanding golden brown matrix with a lot of spiderwebbing affects. Blue Gem Turquoise Jewelry is highly sought after by collectors of Nevada Green Turquoise as it has always had a great reputation of being the epitome of American Turquoise. Battle Mountain Blue Gem Turquoise Jewelry is a different story as Battle Mountain Blue Gem Turquoise is brilliant Blue that is shockingly bright and gorgeous. The mine produce Turquoise in the 1950’s to the early 1970’s and was collectable since the discovery of the material. When you see high grade Battle Mountain Blue Gem Turquoise for the first time you will never forget it! Pilot Mountain Turquoise Jewelry has a close resemblance to Tonopah Blue Gem Turquoise Jewelry as it is very hard and has the same coloration. It is also located close to the Royston Hills wear the same Turquoise characteristics are found. Pilot Mountain Turquoise Jewelry is dynamic as the coloration of the stones run from mid greens and Turquoise blues to rich deep dark midnight blue that is very special and hard to come by. Pilot Mountain Turquoise Jewelry is beautiful, colorful and available in today’s marketplace. 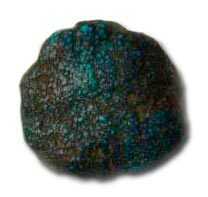 The Damele Turquoise (Damali Turquoise) mine is located east of Austin, Nevada. Benny Damele discovered the Damele Turquoise Mine in 1972-3, Clyde Wright mined the mine for almost twenty years and is now owned by Tony Cotner. Damele Turquoise is known for its unusual green color which range from lime-green through chartreuse; yellow with brown and black webbing and it produces awesome Turquoise Nuggets with bright yellows and greens surrounded in a black matrix which make them stand out like no other Turquoise. Damele Turquoise became popular in the 1990’s due to Tony’s great marketing and the acceptance of a new exciting color in Turquoise by the public. Bead makers in the Santa Fe area started making unusual bright green beads and then later mixed them with multiples of colors which set off new trends in the Turquoise Jewelry market. 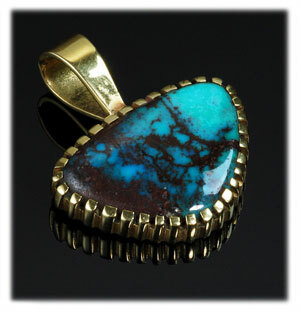 Damele Turquoise has played an important role in the evolution of Turquoise Jewelry. Sleeping Beauty Turquoise is sky blue or Robin's egg blue which has been the epitome of Turquoise since the ancient years when Turquoise was discovered, over 7,500 years ago. When the ancient people of Egypt discovered Turquoise they found sky blue colored gemstone rock that they worshiped and believed came from the fathers above sent to this earth as a spiritual gemstone. Since that time different cultures from around the world seeked out sky blue Turquoise and found it in several places - Persia, China, Egypt and North America. The Sleeping Beauty Turquoise Mine has become the most important Turquoise Mine in the world for producing this highly worshiped gemstone and seeing it in person will convince you just how beautiful this wonderful Turquoise is! is collected by people around the world for its pure Sky blue Turquoise properties. Sleeping Beauty Turquoise is unique to itself and there is no other Turquoise in the world like it. 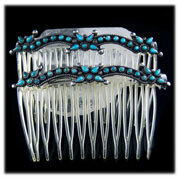 Durango Silver Company has a major collection of Sleeping Beauty Turquoise. We cut our own Sleeping Beauty Turquoise Cabochons and try to always have a large selection of Turquoise Jewelry on hand with Sleeping Beauty Turquoise Gemstones. Sleeping Beauty Turquoise Jewelry from Durango Silver Company is absolutely spectacular, check it out below or search for it in the upper left search box. Ready more on our Sleeping Beauty Turquoise Jewelry page. Shop for Sleeping Beauty Turquoise Jewelry Here! Spiderweb Turquoise is Turquoise with matrix that formed in the shape of a spider’s web. Spiderweb Turquoise Jewelry is the most valuable Turquoise Jewelry in America. Jewelry made with Spiderweb Turquoise usually commands a much higher value as it is rare and Jewelers spend a lot more time to do their finest work when using a piece of Spiderweb Turquoise. Spiderweb Turquoise is found in many Turquoise Mines, but is rare. Nuggets form as aggregates of small pieces of turquoise in clay filled openings commonly have a spider web type matrix. Spiderwebbing also runs in Turquoise veins; in this case caused by plant roots that have died off and created voids for different sedimentary minerals to form and/or cracks caused by movement in the earth, causing the formation to fracture allowing different minerals to seep between the pockets of Turquoise. The pattern is always random in Spiderweb Turquoise with the individual veins of iron oxide matrix ranging in thickness of a hair to wide bands and colors from reds, browns and black. There is no given pattern to spiderwebbing as it is a natural phenomenon, contrasting lines wander through the turquoise, crossing and curving in unique patterns. These contrasting lines are cosmetically attractive and are very desirable to the Turquoise collector and connoisseur. One thing that is for certain Spiderweb Turquoise is rare and Spiderweb Turquoise Jewelry is beautiful! It has exponential value to collectors of Turquoise and there is no doubt it is highly collectible and a great investment for connoisseurs of Turquoise Jewelry. This is the Grand Daddy of all high grade Turquoise in the world! The mine was discovered in 1973 and the Turquoise was mined out by mid 1974. It is so rare that this tiny authentic Lander Blue Turquoise Nugget sold for $38,000.00 in 2008. Rita Hapgood, of Battle Mountain Nevada was picnicking one afternoon at Indian Creek just out of Battle Mountain when she looked up to find a touch of blue Turquoise starring her in the face. She had just discovered the famed Lander Blue Turquoise deposit. Marvin Syme and Henry Dorian found out about Rita’s find and talked her into selling it to them in about 1974. Marvin and Henry named the mine the Lander Blue Mine and formed the Lander Blue Turquoise Corp. They went on to mine Turquoise, pulled out about 110 pounds of high grade and the deposit vanished. They spent a lot of time hunting for more Turquoise at the Lander Blue Turquoise Mine to no avail. Lander Blue Turquoise is a deep rich blue color with jet black Spiderwebbing running heavily through all portions of the stone. Lander Blue Turquoise has now become the most historic and collectable Turquoise on earth and it is the most valuable turquoise as well. Stories are told that certain top grade specimens will fetch over $500.00 per carat which is up over 100% one year ago (2009). 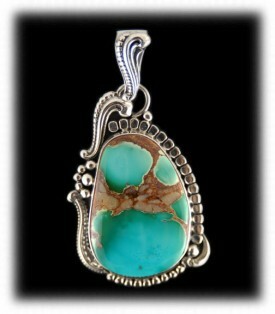 Lone Mountain Turquoise Jewelry is the top of the line when it comes to Nevada Turquoise Jewelry. Lone Mountain Turquoise is known for exquisite light to deep Turquoise blue color with almost perfect spiderwebbed matrix predominately black. Lone Mountain Turquoise Jewelry is very scarce and it is always expensive as it is almost handed out to the premier Jewelers stone by stone. Lone Mountain Turquoise has always been highly controlled and only true connoisseurs of fine Turquoise Jewelry end up with a piece of Lone Mountain Turquoise Jewelry. 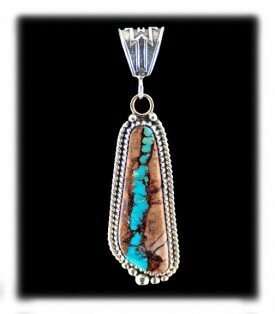 Visit ourLone Mountain Turquoise Jewelry page. General Spiderweb Turquoise Jewelry from various mines – Many Turquoise Mines produce small amounts of Spiderweb Turquoise. It is often spotted by the miner and put aside for his own personal collection, never to be offered to the public. A good share of Spiderweb Turquoise gets to the stonecutters as well and the Stonecutter gets top dollar for the web. 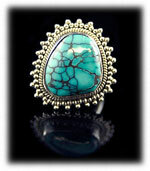 Visit our Spiderweb Turquoise Jewelry examples page. 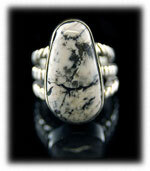 White Turquoise, generally known as White Buffalo Turquoise, is stunning in Southwestern Turquoise Jewelry designs. The physical properties of White Turquoise are not spot on as far as being authentic Turquoise, however, the mass majority of people have adopted it as White Turquoise. It comes from the Tonopah Nevada area and is a controlled mine. White Turquoise Jewelry with White Buffalo is very popular and demand for it is relentless. 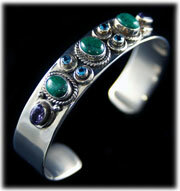 It is made into Jewelry by many silversmiths and Turquoise Jewelry manufacturing shops throughout the Southwest. White Buffalo Turquoise runs pure white to a mottled greasy white color with jet black matrix and it often has some Spiderweb streaks running through it. Another type of White Turquoise Jewelry is made with a material call White Horse. White Horse is a soft white in color with beautiful reddish brown matrix. It too is a very pretty stone which makes beautiful White Turquoise Jewelry. At Durango Silver Co. we make White Turquoise Earrings, White Turquoise Bracelets, White Turquoise Pendants, White Turquoise Rings and more! For more information and photos on White Turquoise Jewelry, read on. Turquoise Jewelry set in Gold is usually outstanding and in high demand by serious Turquoise Jewelry collectors. The demand by the general public for Southwestern Gold Turquoise Jewelry has grown exponentially in the past few years and it is more prevalent throughout the Southwest today. Many of the top Navajo and Zuni Jewelers now only work in Gold and make superior world class Turquoise jewelry that is timeless. Gold Turquoise Jewelry is also standard in many areas of the world such as the Middle Eastern countries, China and Iran. In these areas, Turquoise Jewelry is much different than ours in the Southwest, they prefer very small pieces of Jewelry and they only want them to be made in high carat gold. Many gold Turquoise rings were made in the Egyptian times. A typical tiny pair of Gold Turquoise Earrings in Iran could set you back $1000.00 or more! Turquoise has a very high value in many countries around the world. 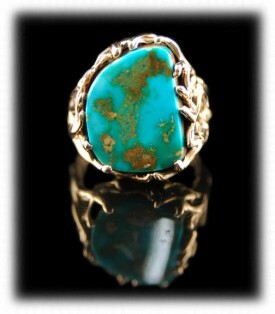 For more information and photos on Gold Turquoise Jewelry, read on. 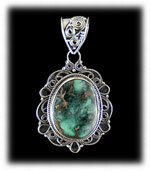 Womens Turquoise Jewelry has always been a standard in the Turquoise Markets of the Southwest. Women from all walks of life love and appreciate Southwestern Turquoise Jewelry. You will find that once a lady starts wearing a piece of Womens Turquoise Jewelry she will wear it often and even daily. Turquoise is a holistic gemstone and it makes a person feel good when wearing it. Many women wear Turquoise Jewelry daily as part of their casual attire, while other women like Fashion Turquoise Jewelry for that special occasion; whatever the case, Turquoise Jewelry is in vogue and Durango Silver Company has beautiful authentic Turquoise Jewelry for any lifestyle. For more information and photos on Womens Turquoise Jewelry, read on. A typical Womens Turquoise Jewelry ensemble may include a Turquoise Ring or even several Turquoise Rings, Turquoise Earrings, a Southwestern Styled Turquoise Bracelet, Southwestern Hair Barrett, Turquoise Pendant or a stylish Turquoise Necklace Set. 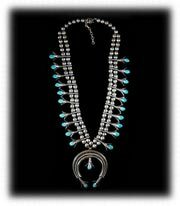 A lady may go all out and wear a Sterling Silver Concho Belt, Squash Blossom Necklace or a beautiful set of Turquoise Beads. Check out our fantastic example pages of Womens Turquoise Jewelry items by clicking your mouse on the links above, you will love browsing our photo tour of Womens Turquoise Jewelry. 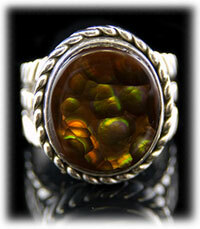 We also invite you to view the Womens Turquoise Jewelry we offer for sale within the Durango Silver Web Site. Remember, our greatest concern is your happiness with a lovely piece of Turquoise Jewelry that we hope will bring you happiness, health and prosperity for the rest of your life! Mens Turquoise Jewelry - Men love Turquoise Jewelry too! Actually, men are some of our biggest Turquoise buyers at Durango Silver Company. They seem to really appreciate high quality Turquoise from special Turquoise Mines. For this reason we make a lot of Mens Turquoise Jewelry and always have a lot on hand. 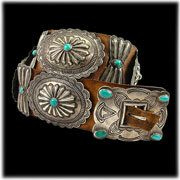 Good Turquoise gifts for Men are Turquoise Bracelets, Turquoise Belt Buckles and Mens Turquoise Rings. Macho Men, Harley Riders and the outdoorsy type of men tend to pick Nevada Green Turquoise as it does not stand out to brightly. Businessmen, Practitioners, and Salesmen tend to pick Arizona Blue Turquoise as they tend to like bright shiny things. Take a look at the mans car or truck and that will tell you if he likes Green or Blue Turquoise in his Jewelry – the man who likes bright colored cars like Blue Turquoise. We also find that we make a lot of rectangular Turquoise Stones up in Jewelry for men, they do like free formed and other shaped stones, however, squares and rectangles are the shapes the largest percentage of men pick. Mens Turquoise Jewelry from Durango Silver Company is generally built heavier then Jewelry for the ladies. You can count on very substantial and manly Jewelry from our company. Visit our Mens Turquoise Rings, Mens Turquoise Bracelets, and Mens Turquoise Buckles pages for Mens Turquoise Jewelry items we have for sale. 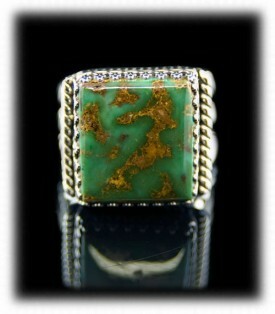 For more information and photos on Mens Turquoise Jewelry, read on. Turquoise and Coral set together to create multi colored Southwestern Style Jewelry is awesome. There are many other colored gemstones that go with Turquoise, however, Mediterranean Coral is the choice of the Native American Indian as well as many other people as soon as they see it. Turquoise and Coral Jewelry has long been a combination the Navajo as well as the Zuni American Indians have made. Rings, Pendants, Bracelets and Necklace Sets are exciting and flashy when made with the Turquoise Coral Jewelry combination. Mediterranean Coral comes from Italy. Italy has also been known to be quality Jewelry producers of the world for a very long time. Mediterranean Coral was exported as a trade good from Italy in the early 1900’s and the Native American Indians fell for it as soon as they saw it. The supplies of natural Mediterranean Coral have been on a steady decline for decades as it is a popular gemstone. It has become fairly expensive and attention to its authenticity must be taken. Mediterranean Coral lookalikes have now hit the marketplace, they are dying and enhancing bamboo and other corals from around the world to look like Mediterranean Coral, beware! There are many quality levels of Turquoise Jewelry that have been made since the dawn of time. Today there are artists making high quality Turquoise Jewelry as well as mass produced jewelry that uses run of the mill stones and is made of thin, light wieght silver. The worst quality of Turquoise jewelry is mass produced costume jewelry that usually has synthetic Turquoise stones and base metal. Depending on the quality of the jewelry, the quality of the stones will greatly differ. Most jewelers save their best stones for their best jewelry. A lot can be told about the jewelry quality by Turquoise and metal used, and finally the price of the jewelry. Turquoise Jewelry made in America is timeless and will always be collectible.